Premium Quality Speaker Spade Terminal Connectors Premium quality angled spade connectors for speaker cable. 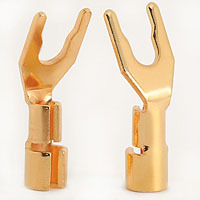 These gold plated terminals have twin fixing screws and a stylish nickel plated handle. Item code: SPATER06. 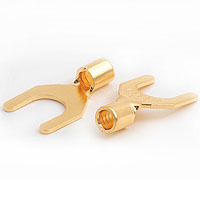 Heavy Duty Gold Plated Angled Speaker Spade Terminal Connectors High performance speaker spade terminal made from high content copper materials and gold plated for perfect signal transfer. This quality crimp or solder fit cable connector is the choice of enthusiasts and professionals. Item code: SPATER04. 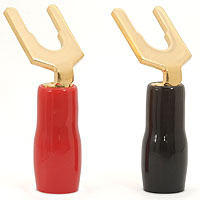 Angled Spade Connectors - Speaker Cable Screw Terminals Gold Plated Gold plated wide jaw spade terminals with a twin screw cable termination for easy fitting and red and black covers. This quality angled spade connector is a very popular choice. Item code: SPATER01. 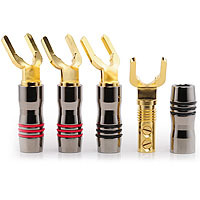 Crimp or Solder Spade Terminals - Gold Plated Speaker Cable Connectors A crimp or solder fit spade connector, this gold plated cable terminal is a convenient choice for terminating home and car audio speaker wires, and offers excellent value. Item code: SPATER03.